There’s an otherworldly quality to some of the work of Norwegian architecture firm Snøhetta that makes me suspect some of its designers aren’t of this world, either. 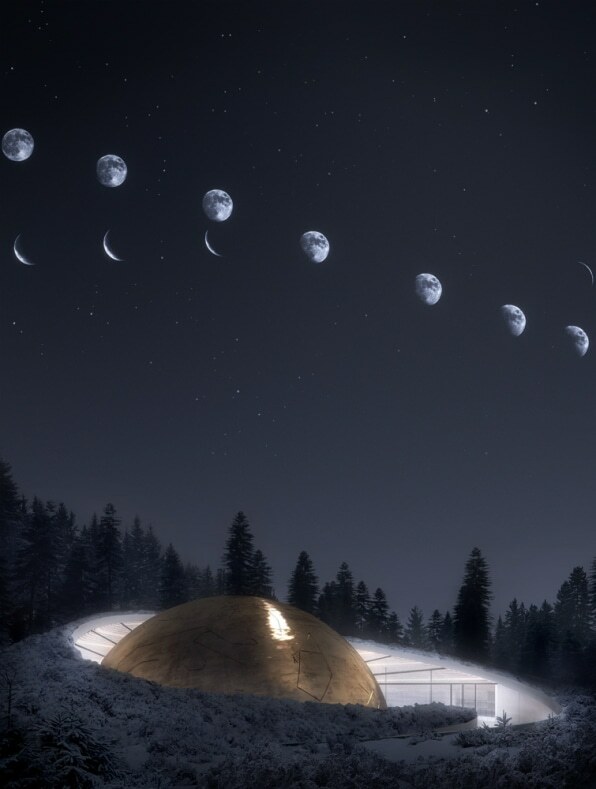 Yesterday the firm released plans and images of its stunningly beautiful planetarium and visitor center for the Solobservtoriet–the largest solar observatory north of the Alps, located 28 miles north of Oslo in the forest of Harestua. Inspired by the structure of solar systems, the new facility is organized around a giant dome at its center. This 16,100-square-foot celestial theatre is “orbited” by a series of other semi-spherical buildings, connected by walkways that snake through the forest. The planetarium’s golden cupola–inspired by the first planetarium conceived by Archimedes around 250 B.C.–is nestled into a green roof covered with grass, wild heather, blueberry and lingonberry bushes. It’s almost as if the structure’s metallic surface, which is engraved with constellations, is bubbling up from the Earth’s core, reaching toward the stars. Inside, up to 100 people can enjoy presentations and star shows displayed on its interior dome by laser projectors, along with a reception, café, and exhibition areas.The rest of the complex is made up of seven “planets” that orbit around this central sun. Each is an independent cabin connected by paths dedicated to different educational and scientific activities–like lectures and seminars. Each sphere ranges in diameter from about 20 to 33 feet in diameter, accommodating between 2 and 32 people, and each is clad with a different material meant to represent unique planetary surfaces with varying degrees of smoothness or roughness. Because they’re all different sizes and heights, the design creates the illusion that some of these buildings have just landed, and others are emerging from the ground to meet them. My favorite part? The smallest planet has two beds where visitors can spend a night looking at the very real stars above it. I need a full week of that, now. Real Innovation Is About Solving Problems, Not Having Ideas.